(CNN) -- Canada will ask the Russian ambassador to explain why two Canadians who worked at the NATO Information Office in Moscow had their diplomatic accreditation revoked, Canada's foreign ministry said Wednesday. 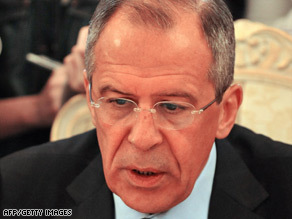 Russian Foreign Minister Sergey Lavrov postponed a trip to Brussels because of the NATO exercises. "Canada strongly objects to Russia's unjustifiable decision to expel [the] two Canadians," said Rene Lemay, spokesman for the nation's Foreign Affairs ministry. The latest developments come after Belgium revoked the diplomatic accreditation of two Russian representatives at NATO headquarters last week. The Belgian Foreign Ministry accused the two Russians of spying activities incompatible with their diplomatic status, Russia's Interfax news agency reported. Moscow described Belgium's accusations as trumped up and promised a response, Interfax reported. Isabelle Francois, the head of the NATO Information Office in Moscow, and another official from her office were stripped of their accreditation, the Russian Foreign Ministry reported. Both were also accredited as attaches with the Canadian Embassy in Russia. Russia is refraining from declaring the two personae non gratae, a Russian Foreign Ministry official told Interfax. Russia is unhappy with NATO military exercises beginning this week in Georgia and scheduled to last a month. Russia has accused the alliance of "muscle-flexing." Russian Foreign Minister Sergey Lavrov postponed his trip to Brussels, Belgium, for Wednesday's ministerial meeting of the NATO-Russia Council because of the planned exercises, Lavrov told the Itar-Tass news agency. A spokeswoman for NATO, however, said Lavrov was never supposed to attend the meeting because it is being held at the ambassadorial level. It was unclear whether he was intending to be in Brussels for another matter. NATO ministers had agreed to use Wednesday's meeting "as a forum for dialogue with Russia on all issues -- where they agree and disagree -- with a view toward resolving problems and building practical co-operation," said an announcement issued earlier this year.